Millibar has re-engineered one of the gas industry’s key tools for rapidly locating gas leaks. 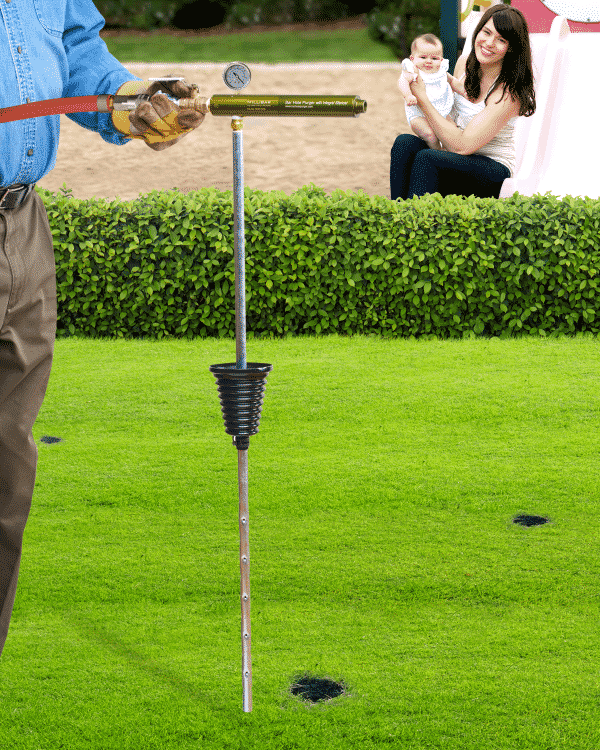 It’s time to protect your hearing and put an end to noisy bar hole purging! Now you can efficiently and quietly purge bar test holes and zero in on possible gas leaks with the Millibar BHP-375 Bar Hole Purger. Designed with lower noise exposure for the gas utility technician and people in the area of the purging operations, the Millibar BHP-375 Bar Hole Purger has an integrated self-cleaning silencer for guaranteed quiet operation. The BHP-375 operates at an 85 dB level compared to 125 dB for other brands. That’s a 16X reduction in perceived sound level (what the human ear hears) which reduces the risk of hearing loss due to extended exposure. Ideal for purging operations in residential areas after hours. The heart of the Millibar Bar Hole Purger, the venturi vacuum pump and integral silencer are completely indestructible. Designed to operate between 80 and 120 PSI and generate full vacuum (28"Hg) and 28 SCFM vacuum flow, the BHP-375 will quickly evacuate bar holes in all soil structures. We are so confident in the quality of the BPH-375 Bar Hole Purger that we stand behind it with a lifetime guarantee. The Millibar venturi vacuum pump and integrated silencer are replaceable free of charge for the life of the product. Now you can efficiently and quietly purge bar test holes and zero in on possible gas leaks with the Millibar BHP-375 Bar Hole Purger. Available with optional 2" dial face , stainless steel vacuum gauge to monitor operation. 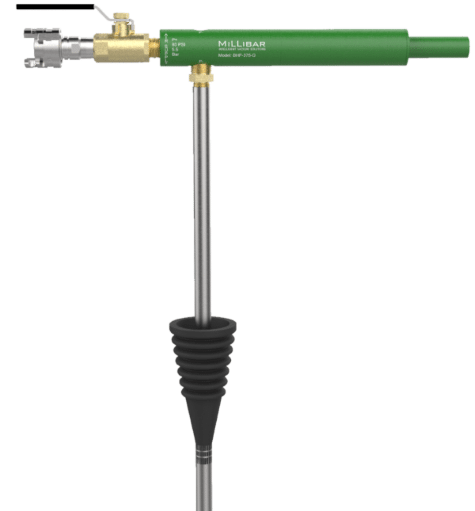 The Millibar BHP-375 Bar Hole Purger is designed for rugged use in field environments. The product ships with a ¼ inch NPT flush plug for operation without the gauge. The BHP-375-PSS is a very powerful venturi vacuum pump capable of generating 93% full vacuum (28"Hg, .93 bar) and 28 SCFM (793 l/min) of vacuum flow. It is ideal for evacuating large areas quickly and may also be used for removing liquid from holes. It's no-moving parts design allows liquid and small debris to pass through the pump. The threaded exhaust port allows plumbing the exhaust away from the pump. The integral dual lock quick connector provides a fast and secure connection to your compressor. The ball valve allows manual on/ off control of the compressed air to the pump. If the exhaust from the pump is not plumbed away, please consider purchasing one of the other BHP models that have an integral silencer for quieter operation. Without the silencer this pump will create sound pressure of 125 dB. Hearing protection is recommended.